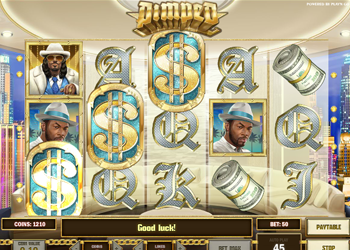 Pimped is a brand new video slot, which inevitably has plenty of its imagery based on the glittery and golden world of gangster rappers. 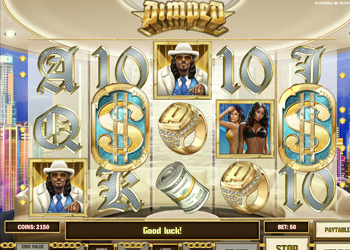 Pimped has been designed and developed by Play n Go, and contains some rather realistic looking characters, one of which is almost certainly based on Snoop Dogg. From rolls of bills, to golden rings, bikini clad babes, golden dollar signs, and silvery high-playing card icons, there’s a very “bling-bling” look and feel to the Pimped online slot. The question is, does the gameplay live up to the stylish look? In this online slot review, we’ll try and find out. Pimped does not have the most complex gameplay structure we’ve ever seen, which makes it rather simple to play. It also allows players complete control over how their wagers are constructed. In all, there are 10 paylines sitting on 5 reels, all of which are adjustable. Players can choose coin values which range from 1p up to £2 in this game, and they are also at liberty to wager anything from 1 to 5 coins per line. As we’ve said, all of the paylines in the online slot can be altered. This will ultimately see you staking anything from a floor bet of just 1p per line, per spin, up to the ceiling bet of £100 per spin on Pimped. As with any video slot, the high playing cards make up the lowest paying symbols in the game. In Pimped, these range from 10s up to Aces. The lowest pay-out which you can possibly obtain is just 3 coins, which is awarded for a Three of a Kind winning combination of 10s through Kings. Five of a Kind winning combinations of 10s, Jacks, Queens, Kings or Aces pay out 50, 75, 100, 125 or 150 coins, respectively. You’ll land much bigger pay-outs with the thematic imagery, which are represented by the aforementioned dollar bills, ring, babes, and two character icons. Dollar bill symbols pay the least, with 5 coins for a Three of a Kind. The best paying standard icon in the slot is the Snoop Dogg lookalike, which is worth 750 coins if five appear in any winning combination. Players should keep an eye out for the wild symbol in this game. It won’t be hard to miss, since it looks like a knuckleduster. If 3, 4 or 5 of these symbols appear in a winning combination, players will win as much as 50, 200 or 1,000 coins. Wilds can substitute themselves for all other icons in the game except the scatter icon, and appear on all reels in the game. We should probably also mention that wilds can appear stacked, in Pimped. Speaking of scatters, that icon is the glittery dollar sign. If a player was to land 3 or more scatters in any position upon the reels, then they would trigger a free spins bonus game, where they could win as much as 1,000,000 coins. Pimped’s free spins bonus is a thing to marvel out. Initially, you may be a little bit dismayed with the fact that you are only going to land 5 free spins. Don’t be, because it does get better. In Pimped’s free spins bonus, you are guaranteed a win on every free spin, with no exceptions. Furthermore, if you land a scatter on the reels during the free spins bonus, you will pocket an additional 2 free spins. That’s two more free spins per scatter. This is in stark contrast to other slots, which require you to land 3 additional scatter icons in the bonus, to win more free spins. Players can keep winning free spins, until 20 additional free games have been won. After that, the bonus ends and the player returns to the base game. Pimped is just one of many brand new video slots which you will find at Guts Online Casino. With new slots added all the time, Guts is the number one online gambling domain to play the hottest new titles. If you haven’t joined Guts Casino yet, then why not do so today? You are entitled to claim a welcome bonus worth up to £300 upon making your first deposit, and you can bag 100 free spins as a new depositing player. If this online slot is for you, head on over to Guts Casino to get on it right now.